November is in the books for the San Ramon real estate market and things are looking very similar to last year. 609 homes have sold in 2011 versus 605 in 2010. Median home prices have come down a tiny fraction while the time to find a buyer has risen from an average of thirty-one to forty-three days. Attached home sales have risen nicely but like many surrounding communities the pricing has come down. The time it takes to sell a condo or townhouse is pretty much the same as single family homes. We will see how the year finishes off in early January. In the meantime enjoy your Holidays and if you are interested in purchasing a home or planning to sell I am always here to assist. 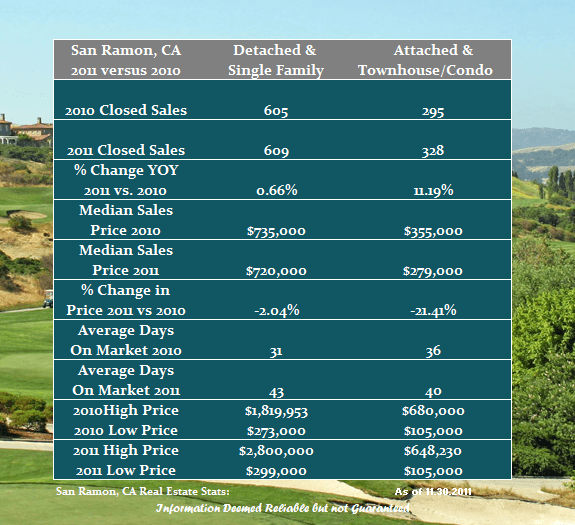 Share the post "San Ramon Real Estate Review thru November"